Frittatas are becoming my go-to meal if I'm in a pinch. 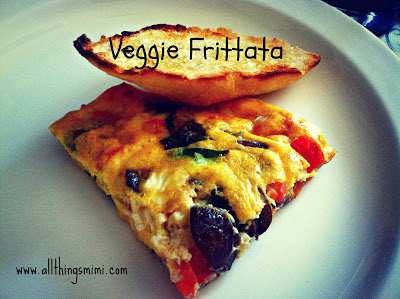 A frittata is the lazy girl's omelette. There is no recipe- or at least I don't use one. It's more of a technique than a recipe. I chopped up some swiss chard from the garden, about 4 mushrooms, half a tomato (leftover from sandwiches the day before), half a Vidalia onion, and a wee bit of fresh garlic. I crumbled the leftover bit of feta cheese from the icebox. I beat 4 eggs together with a dash of salt, a splash of milk and a smidgeon of hot sauce. I sauteed the veggies in a pat of butter until they were soft. I poured in the egg mixture, then dumped in the feta. I scooted it around in the pan with my spatula until I had everything where I wanted it. I let it cook on the stove top over medium heat for about 4 or 5 minutes, then I moved it to a 400 degree oven for another 10 minutes, but I started checking for doneness after 5. It's done when the middle doesn't giggle anymore. When it was done, I scooted it onto a cutting board and cut it into 4 wedges. It fed Devin and I with one triangle leftover- which ended up between two pieces of home made bread later that day. Seriously, you can put anything in this and it can be breakfast, lunch or dinner. What's not to love?